Peter Carter has been successfully treating patients for over thirty six and has gained extensive hands on clinical experience. His Osteopathic approach is centered on promoting a strong structural base and restoring normal mobility and function to all areas of the body. Peter Carter has special clinical interests in pelvic realignment, feet and wrist health, women’s reproductive disorders, sports injuries and sports rehabilitation. Peter believes in working with the mind-body connection to facilitate your optimal well being. His extensive experience extends to the treatment of children. Osteopathy provides a safe, gentle, effective treatment for children’s developing musclo-skeletal systems. 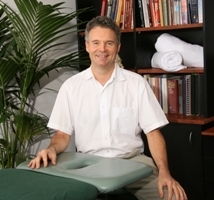 Peter Carter is a graduate of the International College of Osteopathy, Sydney (1981) and is registered with the Australian Osteopathic Association. Peter has published various articles for a variety of Osteopathic journals.